Here at Collections Etc., our goal is to provide our discerning customer base with unique new solutions for the home. With this in mind, we’re delighted to introduce you to one of our very favorite categories of outdoor décor — decorative garden stakes. 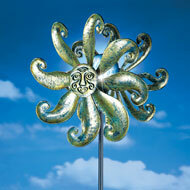 These clever exterior decorations bring big personality and charm to your yard without a ton of work or a big spend. You’ll find easy-to-use yard stakes for just about every occasion, theme, event or landscape style at Collections Etc., so be sure to explore our entire selection for fantastic ideas. 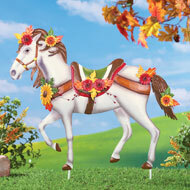 The garden stake is uniquely designed to provide an instant pop of personality to your front or backyard. All you have to do is pick from our great assortment of durable, weather-resistant metal garden stakes and place them in your yard. Unlike other types of outdoor decorations, yard stakes often require no power, no tools and no complicated installation. This means that you can swap out your stakes for the season to give your space an especially festive or seasonal feel without wasting an entire Saturday on installation. Whether it’s a set of lifelike flower stakes for springtime or one of our holly jolly Christmas yard stakes in December, you can be totally sure that your property will delight passersby any time when you decorate with these splendid stakes. Shop styles for temporary and year-round use so you always have something that brings a big smile. And don’t forget to consider our unique picks, like spinning, colorful and lighted garden stakes that put on an enchanting show outside your home. Check back throughout the year for more wonderful options. 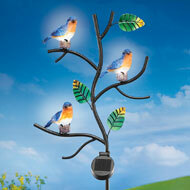 Charming day and night, this solar-powered stake features three brightly colored bluebirds perched on branches. 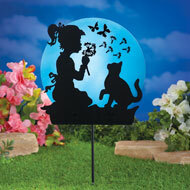 The birds and leaves automatically shine with solar-powered light at night. Includes 1"AAA" rechargeable battery. Plastic, resin and metal. 12"L x 33"H.